PoE Giga-McBasic LFPT are the perfect solutions for network applications that require Power over Ethernet for locations inside buildings where PoE is required to power an Ethernet device. Their small, table-top design and durability make them perfect for installation anywhere space is limited. Additionally, both units are manufactured with an internal AC power supply. This feature significantly increases reliability over products that use awkward, external AC/DC power transformers. 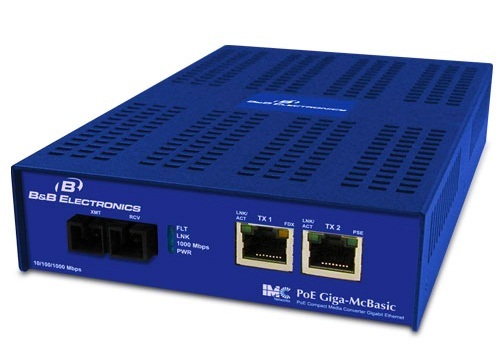 The PoE Giga-McBasic LFPT unit comes with one SFP or fixed fiber transceiver, one PoE/PSE 10/100/1000Base-T copper port that provides 15.4 Watts of power with data, and one 10/100/1000 Mbps copper port to connect a non-PoE unit to the same fiber uplink. A Link Fault Pass Through DIP Switch is available, to enable a link LED troubleshooting feature. As a fiber-fed media converter, it provides both power and data to a remote device over standard CAT5, eliminating the need for additional power to the remote device. The copper ports Auto Negotiate to the connected device’s speed and duplex mode: 10 Mbps, 100 Mbps or 1000 Mbps, and HDX or FDX (including Flow Control). Additionally, both models support jumbo frames up to 10240 bytes.